Something Fantastic Made With Leftover Chicken Stock or Rich Penne with Chicken Sausage (serves 4-6) | Crappy Kitchen - Good Dinners! Have you ever cooked a chicken or some other meat (either roasted or boiled) and after dinner still have a couple of cups of liquid left over? The thing that I hate the most in this world is to waste perfectly good food. People go to the trouble of making dinner and then after dinner something strange happens: the thing that was so enjoyed a few minutes earlier gets relegated to the category of waste or scraps. Why do we regard the part of the dish that has not been eaten as somehow inferior to what we just oohed and aahed over moments earlier? It’s time for you to start saving that cooking liquid and stop buying pricy cans and cartons of broth that is not half as good as the stuff you throw out after dinner! As unappetizing as this looks, you should never throw away perfectly good stock from a cooked chicken! What you see in the picture above is what I had leftover after a chicken dinner the other night. I had roasted a chicken with some basic veggies and added liquid to my pan halfway through to get a pan sauce without actually making one. After dinner, the chicken was gone (along with everything else) but this was left in my roasting pan. Most of the time this gets thrown out – admit it! it is so much easier to scrape this into the garbage than it is to put it in a container and store it in the fridge. 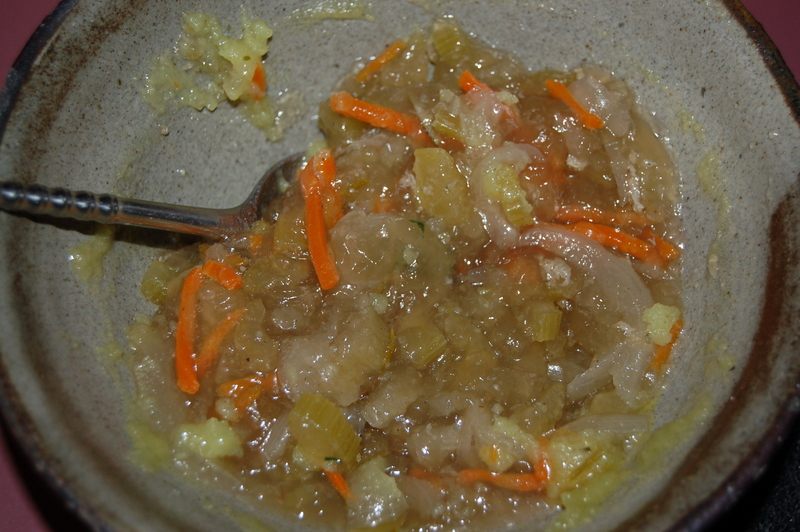 When you throw something like this away you are throwing out the backbone of so many dishes that can be made in a hurry with delicious results if only you had saved what looks like a congealed mess. I made this dinner merely to prove my point, and this is only one use. 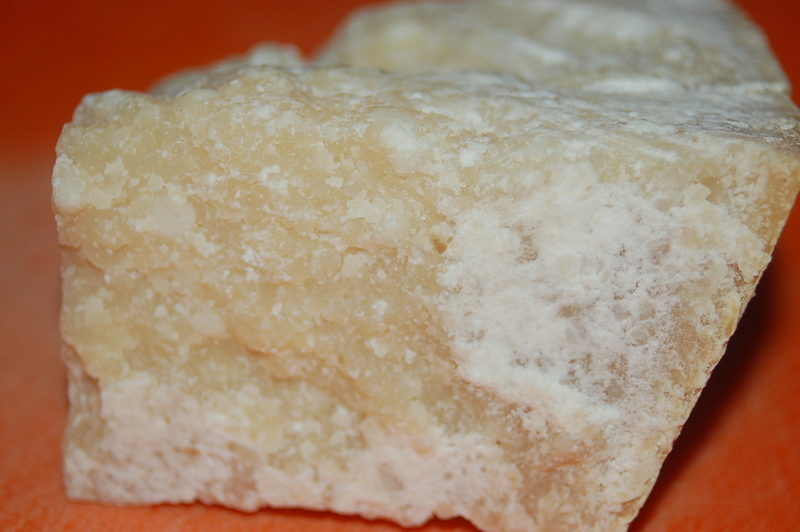 It can be used in a soup, in simpler pasta dishes, or added to a rice dish as the stock. You can also add water to it and discard the cooked veggies (using a sieve or small colander) and substitute it anywhere broth is called for in a recipe. It will taste far superior to its store-bought counterpart. 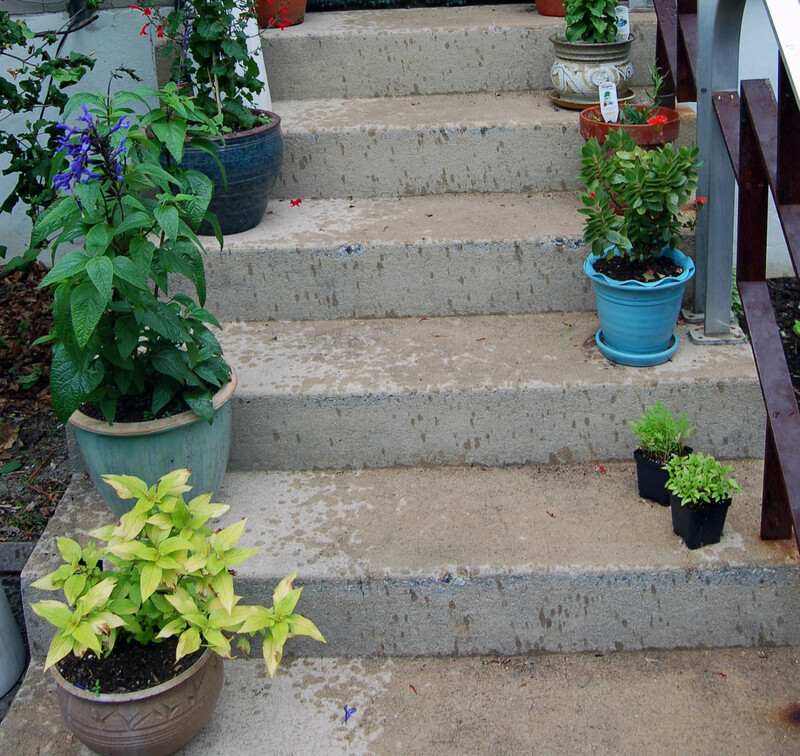 The back steps are beginning to look a little more Summery and I can’t wait for my garden to become lush and alive with herbs and flowers. Of course you can still make this dish with bought stock! I guarantee you that I most definitely do not have stock in my fridge every time I need it and resort to bouillon cubes and water more often than using precious saved chicken juices. I just wanted to let you know that the thing you have been throwing away after some of your dinners could be put to good use! 1 – Put big saute pan on medium heat and add the oil. 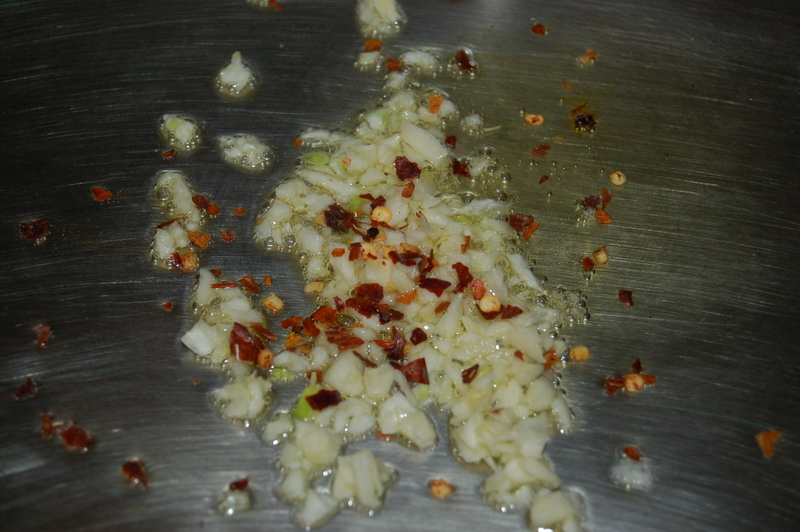 When it has warmed, add the chopped garlic and the chili flakes. Swirl around and cook for about 1 minute. 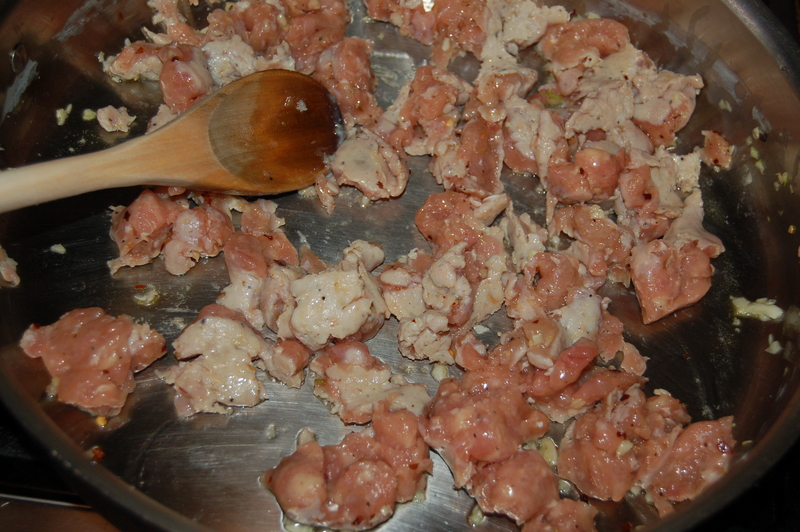 2 – Add the sausage in bits (I broke it into the pan right out of the casing). 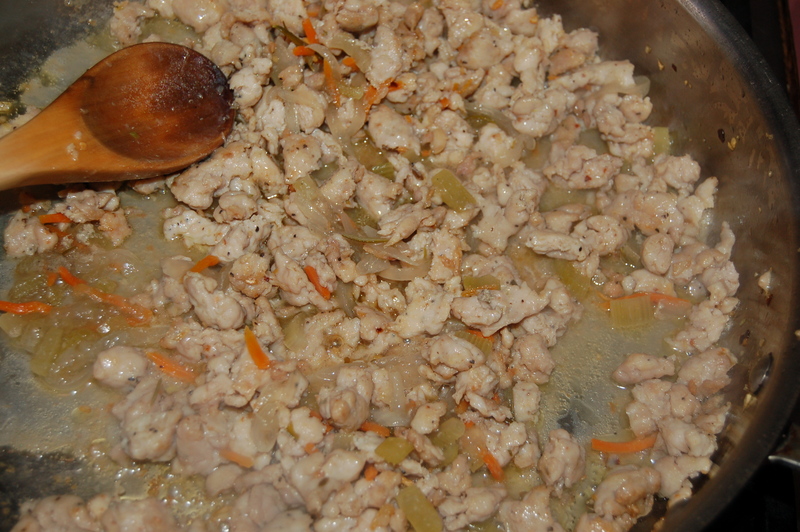 Cook until the sausage is browned and nearly cooked through (about 12 minutes). You will need to stir and break sausage up with wooden spoon intermittently as it cooks. 3 – Add the leftover stock (or whatever broth you are using) and let it come to a simmer. You may turn heat up slightly while you add the liquids. 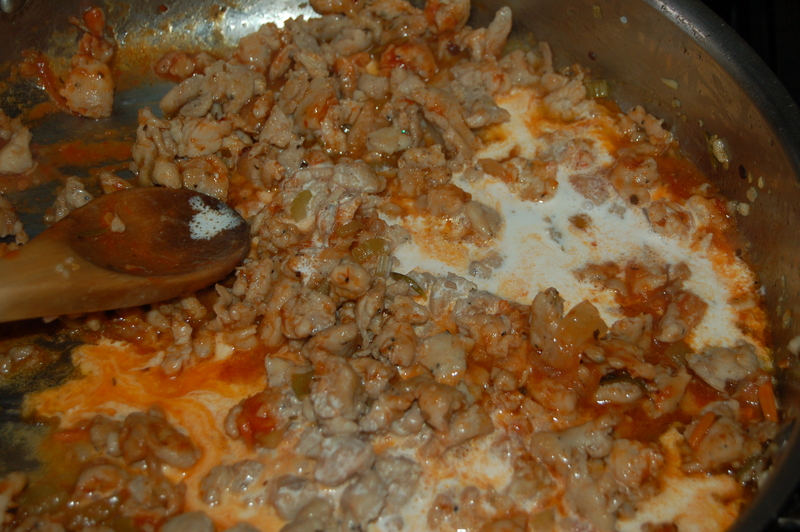 4 – Add the tomato puree and stir into the sausage mixture before adding the cream. Add the cream and let the sauce come to a slight boil. 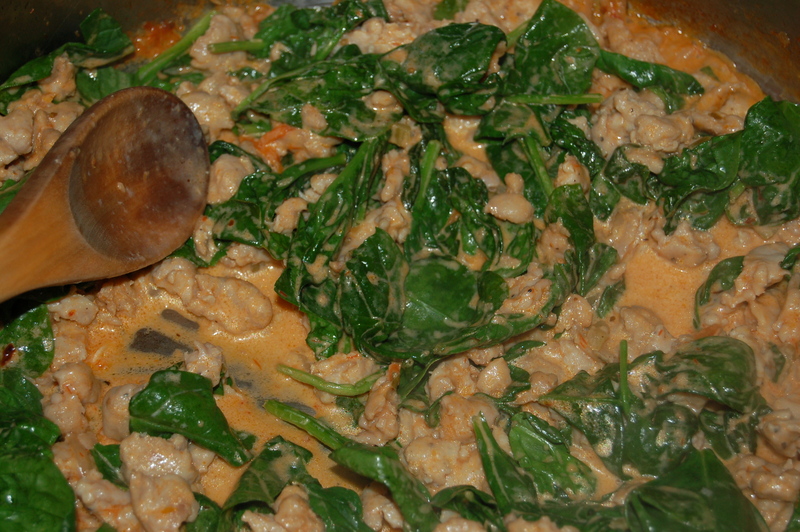 5 – Add the spinach and stir. Cover pan with a lid, turn heat down and cook for about 2 or 3 minutes at a low simmer. 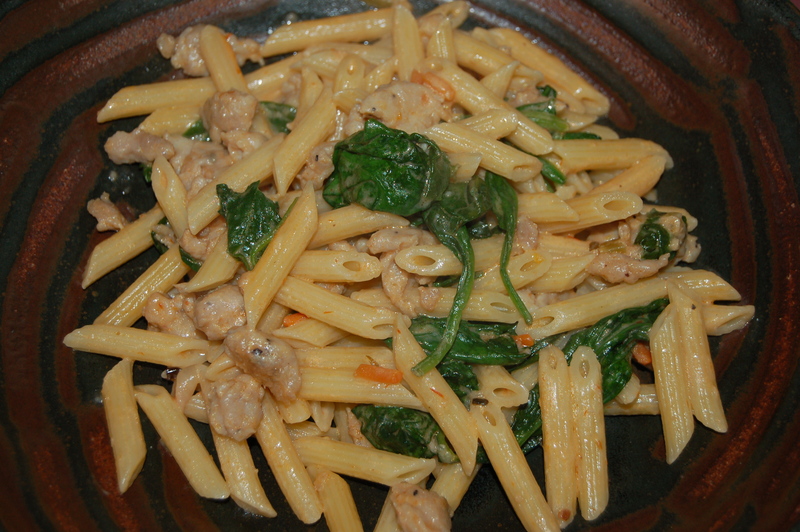 6 – Turn off heat and add the cooked penne to your sauce and stir. You may also add a tablespoon of cold unsalted butter at this time if you want more glossy creaminess. If you like a thinner sauce or want to loosen the pasta a little, you may add some of the reserved pasta water until you are satisfied. You may also taste for addition of salt and pepper. Divide between bowls and pass grated Parmigiano Reggiano and more red pepper flakes if you so desire. 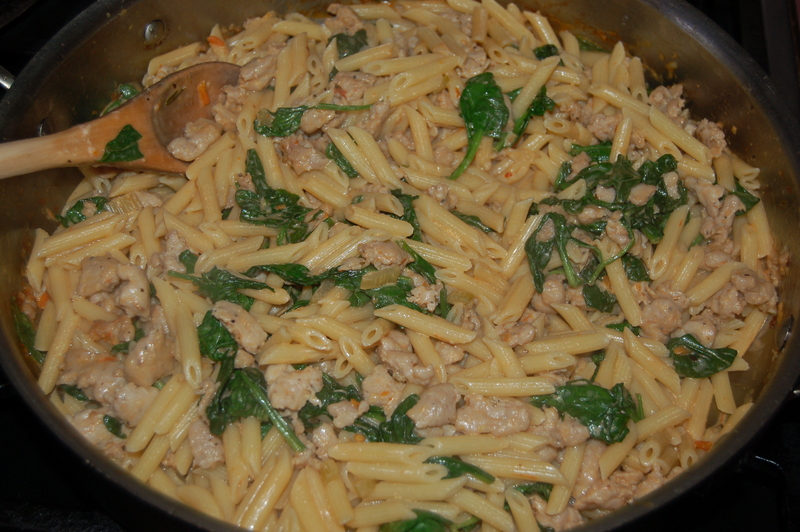 This entry was posted in dinners and tagged broth, chicken sausage, easy pasta dinner, great cheese, herb garden, leftover stcok, leftovers, Pan sauce, Parmigiano-reggiana, pasta, pasta dinner, rich pasta dish, stock. Bookmark the permalink.